We rode 22.13 miles today. We left the hotel in Meaux around 9 am, after having breakfast at the hotel. We left our suitcases and bike bags at the reception, and they will store them until our return on 11 Jun. 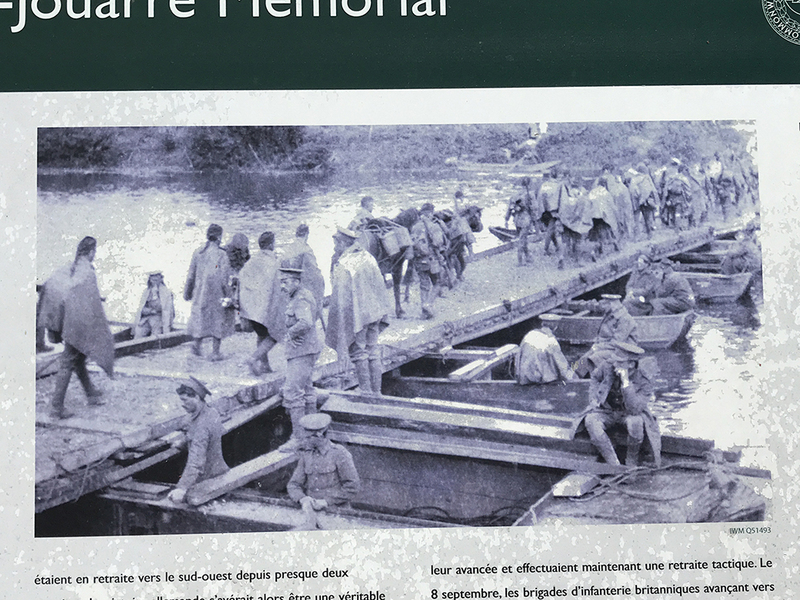 We crossed the River Marne at Trilport, a relevant place in WW1 history because of the bridge there. The masonry road bridge was destroyed in 1914 as British Expeditionary Forces were retreating from the Battle of Mons, but depending on which account you read, it was either the French, the British or the Germans who destroyed the road bridge (and one of them also destroyed the railroad bridge which crosses the Marne at Trilport.) In any case, we crossed the river there and headed east. The Marne makes loops and curves as it meanders westward, but our route did not closely follow it on the first part of this day. We chose instead to ride up some hills (theoretically to save some miles.) Our planned route called for a right turn at the second street in Trilport, but we goofed and turned one street too early. We did not discover this error until we were 3 or 4 miles down the road and headed south, not the direction we needed to be going. 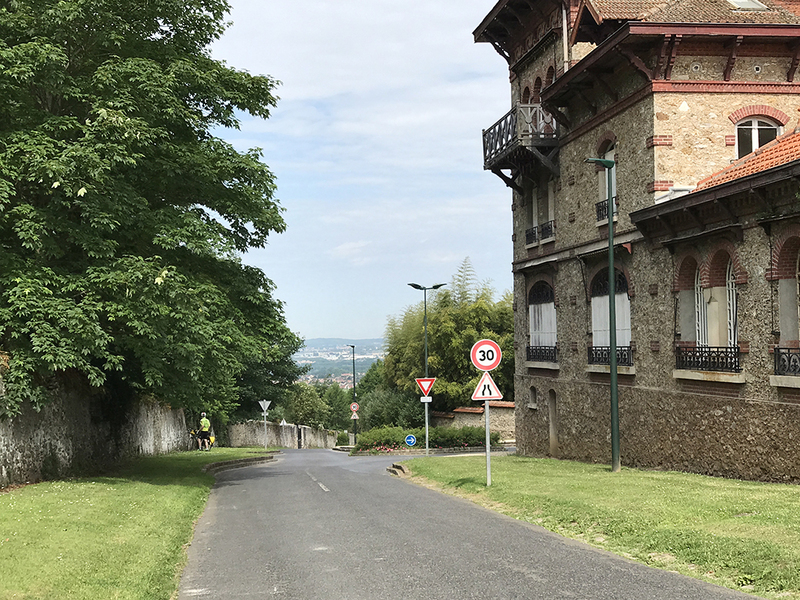 After retracing our route for part of the way and consulting the map frequently, we rejoined our planned route in the village of Montceaux-lès-Meaux, where we saw the hill we were supposed to ride up and pronounced ourselves not only lucky but also very smart for going off course and avoiding it. 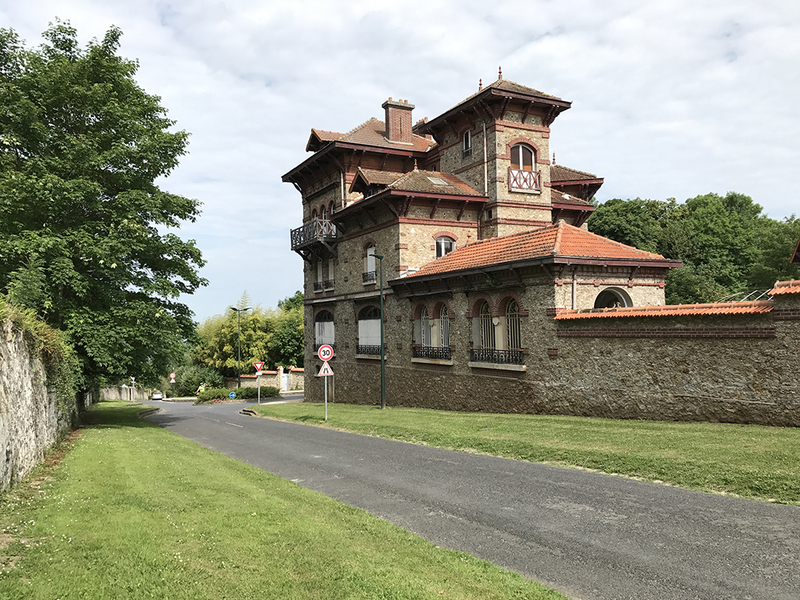 We admired the old chateau at Montceaux-lés-Meaux and took a few photos and then moved on. 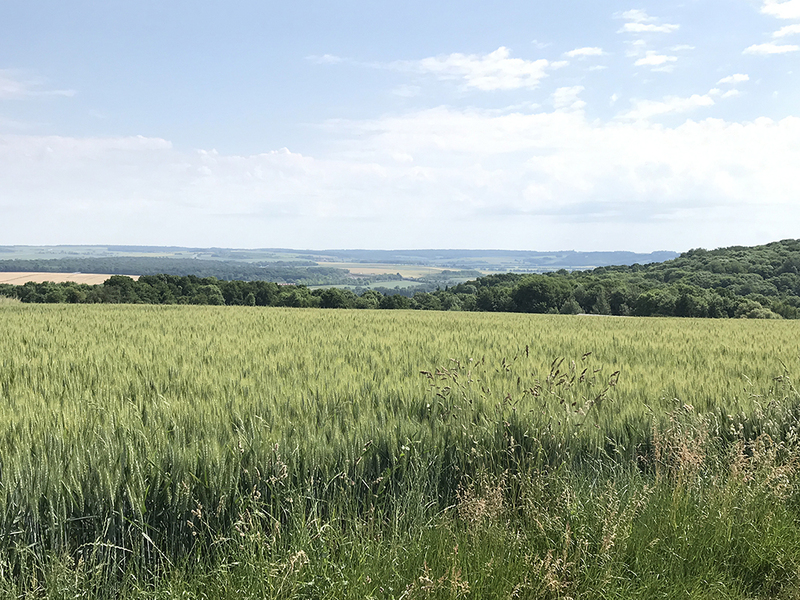 As we moved east from that village, we were on a plateau which eventually gave us a spectacular vista of the Marne valley. My mind was filled with so much joy, and my senses practically overwhelmed. On our right were wheat fields, not yet ripe but looking almost like a soft blanket of green-gold in a gentle breeze. On our left was a field of another grain -- we weren't sure but thought perhaps it was rye, a deeper bluish-green and so free of weeds and poppies that it was remarkable. In front was a narrow blacktop road, curving gently to the right, and the river valley was directly in front of us. I thought of the soldiers from 100 years ago, who moved across this plain in wool uniforms even during the heat of summer and probably carried more weight than Steve and I had packed in our panniers. We shifted gears as we started a gentle incline, and I was thankful that we moved our load with wheels, unlike the Tommies and the Doughboys. As we made our way around the curve, we started a descent to the valley floor, flying downhill through the woods. I used my brakes excessively and thought how my friend Jerry Boyd would enjoy that. I was flooded with a bunch of aromas -- linden trees in bloom, elderberry blossoms, mown grass drying in the sun, sunscreen, and -- as we passed through woods on the way down -- the musty smell of the cool woods. We passed through the village of Saint-Jean-les Deux Jumeaux -- which translates to "Saint John of the Two Twins," but I could not find any more information about the origin of that name. Around mid-day, we stopped in the town of Ussy-sur-Marne for some water and a couple of sandwiches (jambon blanc avec beurre -- ham with butter) and consulted our maps. It was quite warm -- around 80 degrees or so, and it was refreshing to get off the bikes for a bit to cool down. We paused in La Ferté-sous-Jouarre to view a monument to British troops who perished in the region in 1914. A memorial here on the banks of the Marne commemorates 3,700 British soldiers who fell in battle between August and October in 1914 and whose remains were never found. 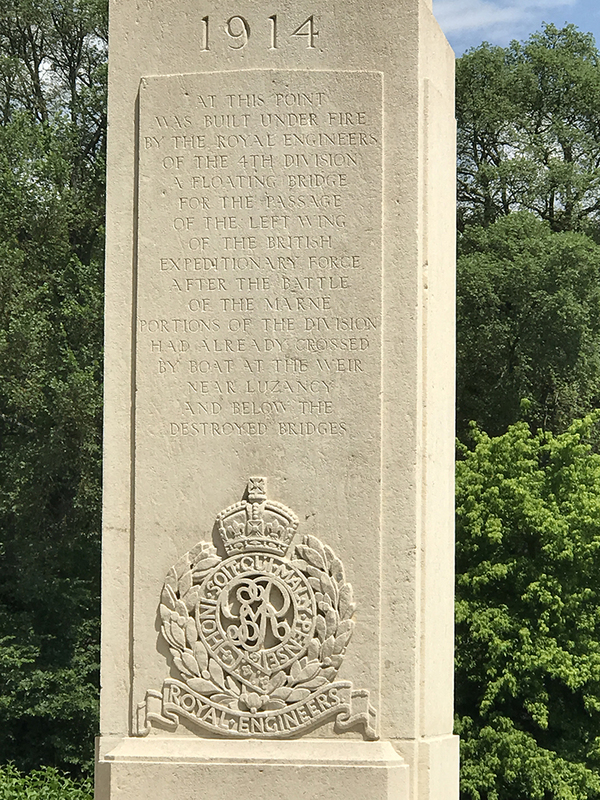 Nearby, on each side of the river and just a few yards east of the present-day bridge stands a pylon which pays tribute to the Royal Engineers of the 4th Division who built -- while under fire -- a floating bridge across the Marne, enabling their troops to join up with units which had already crossed the river at Luzancy. This was part of the British retreat from Mons, sometimes also called "The Great Retreat," when the British forces moved southward from Mons, Belgium to and beyond the River Marne. The retreat was halted by the allies' stand in the 1914 Battle of the Marne, when the German encroachment on the doorstep of Paris was finally turned. As noted on the sign at the memorial in La Ferté-sous-Jouarre, this also marked the beginning of trench warfare as German and Allied forces became entrenched during and after the Battle of the Aisne in mid-September 1914. By November, battle lines that had been drawn remained virtually unchanged for another four years. La Ferté-sous-Jouarre is also known for its millstones, used for milling flour. One website I consulted claimed that the area provided millstones for the greater part of France and have even been found in England. From that point, we joined a busier road which wound its way along the banks of the Marne and delivered us to the doorstep of our overnight lodging at the Auberge du Lion d'Or in Nanteuil-sur-Marne, where I am presently sipping a fine Belgian blonde. We have an upstairs room, where we each took a refreshing shower and laundered the day's bike clothes. We made a dinner reservation in the establishment's on-site restaurant for 7:15 pm. The forecast of thunderstorms by 11 am did not materialize in this area by mid-day, but it is now 6 pm and a light rain has started. The forecast for tomorrow does not look favorable. Sometimes going off course (we don't use the "L" word) means you do not have to climb a steep hill. Google Translator is a godsend. Villages of caractère deserve more of our time.